The Nikon A “falling knife price” continues! As of the time of writing, you can get it for $464 in either silver or black by Norman Camera through Amazon. Amazon’s own price is $483 for the silver and $500 for the black. If of all the Nikon DSLRs out there it is the Nikon D7000 body only kit the one that you want, it is currently on sale for $525 with free shipping, with a limit of three per shopping cart at Amazon by Amazon herself. Another “prearranged marriage” at the eBay Deals, this time it is of the Nikon DSLR variety. For $430 with free shipping, BuyDig’s eBay store is offering the manufacturer refurbished Nikon D5200 w/18-55 _PLUS_ Lightroom 5 for $430 with free shipping, with a limit of five per buyer. It comes with a 90 day warranty. The Nikon gear is refurbished. Lightroom is not refurbished 🙂 As usual with these featured eBay Deals, they are limited time, of unpredictable exact expiration date. UPDATE: on the other hand, if you prefer new condition and you don’t need Lightroom, Adorama is offering new condition Nikon D5200 two lens kits (18-55, 55-200, both DX non-VR) for $700 that include WU-1a Mobile Adapter, travel case, 16GB card, Nikon School DVD in either the red kit or the the black kit. If you are interested in stocking up on Nikon DSLR Gear, especially Lenses, on-going is a buy-more to save-more Nikon Instant Rebates promotion at B&H Photo. That dedicated page is nicely organized by digital camera, click on the camera of interest and pick the options of interest to check the price combinations. Participating DSLRs go all the way, D3200, D3300, D5200, D5300, D610, D7100, D750, D810, Df and D4s. Offers end around 12/13/14. This is an older post… We have a mini-burst of Big Sensor Prime discounts. If you are interested in the black Nikon A, it is now down to $500 in refurbished condition at Adorama, while the new condition has drip-dropped to $580 at Amazon by Amazon herself (limit 2) and B&H Photo. Buydig has taken the $500 Nikon D3200 two lens non-VR kit you see in the many Black Friday Ads and added the Adobe Photoshop and Premiere Elements 12 software (previous version) for FREE! Offer ends 11/30/14 or earlier if sold out… For more specials, check their Black Friday sales page. PS: if you are just now catching up to the madness, you can also check a summary of the latest deals at the Black Friday 2014 Situation Room. The Nikon D3200 two lens kit for $500 advertised in some of the Black Friday Circular Ads is also price-matched by the internets. You can get it for $500 with free accessories as well at Amazon by Amazon herself. Keep in mind, this is the non-VR bundle! This limited time offer ended… The Nikon Coolpix L830 compact-zoom is one of the cameras found in many Black Friday Ads but as it is often the case, the internets have price-matched it, you can now get the camera for that price with free accessories at Amazon and B&H Photo… However, the internets are not able to defeat the Citibank Thank You Rewards program (members only with enough points), you can claim it for 14800 (= $148 equivalent) there on Cyber Monday only (no free accessories). This daily deal expired… Surprise-surprise! The Amazon Gold Box deal of the day for Thursday is the new condition Nikon D7000 with 18-55mm going for $650 with free shipping, with a limit of two per shopping cart! The body only goes for $550 while the two lens kit (55-200 DX VR) goes for $800. Offer ends by 3am ET on Friday or earlier if sold out. To the eBay Deals we check upon, where find the manufacturer refurbished Nikon D7100 body only, along with two 64GB 600x SDHC memory cards and a case offered for $800 with free shipping and a 90 day Nikon warranty by Adorama’s eBay store. Limit 5 per buyer. This limited time offer expired… Back to the eBay Deals, another combo offer from Beach Camera’s eBay store, you can get the manuacturer-refurbished Nikon D3200 with 18-55mm PLUS Lightroom 5 for $300 with free shipping, with a limit of five per eBay shopper. As with all eBay Deals, this is a limited time offer of unpredictable expiration time. As of a 12/2/14 recheck, this is sold out… The Nikon Coolpix P530 superzoom goes for $300 in new condition (with free accessories at B&H and Beach at Amazon), but if you want to pay a lower out of the wallet price, you can get it factory refurbished for $230 with free shipping and 45-day returns at BuyDig.com. The Nikon A Big-Sensor-Prime’s price took a while but finally started coming down to reality. You can now buy two of these for the price of one Fuji X100T. You can buy two because B&H Photo has the Nikon A cameras (either color) on sale for $600 with free shipping and free pouch and 16GB SDHC card. With free expedited shipping. This limited time offer expired with 100% claimed… The headliner of the Lightning Deals camera-wise for Monday is the certified refurbished Nikon D3300 with 18-55 DX VR and 55-200 DX lenses offered for $500 with free shipping, sold by Beach Camera on Amazon, with the order fulfilled by Amazon (eligible for free 2-day Prime shipping). Offer ends by 2:50pm ET or earlier if sold out. Also one of the featured eBay Deals is the new condition imported/grey-marked Nikon D610 body offered for $1200 with free shipping, with a limit of five per buyer. The seller is bigvalueinc (99.4%). Over 120 cameras got sold through this eBay listing so far. The standard Nikon D610 body only kit from authorized Nikon USA dealers goes for $1600 (eg Amazon, B&H Photo), so you have trade-offs, such as $400 vs manufacturer-warranty, authorized Nikon dealers vs eBay sellers and such. It’s up to you to triangulate your risk matrix on deals like this – there’s no one size fits all answer. If you are part of the Citibank Thank You Rewards program (many of their credit cards are part of this program), they will have select merchandise redemption promotions on Cyber Monday (December 1st, 2014). Of the ones shown on their website, the Nikon Coolpix L830 will be offered for 50% off in redemption points. Normally this requires 29600 points to be redeemed, which is very unfavorable considering the camera goes for $200 at Amazon and will go for $170 with freebies during Black Friday. However, on Cyber Monday, you can redeem this for half the points, so 50% of 29600 = 14800 = $148 equivalent assuming a 1:1 points to pennies ratio. UPDATE (11/18/14): as of this update, this is marked as an “Item Under Review”. It will be unavailable for purchase for a few hours/days until it gets sorted out. It is not uncommon for this thing to show up on various Amazon.com listings. Amazon is now selling refurbished products “natively” (on the main product page), not just the Warehouse Deals. One of the guinea pigs of this new development is the refurbished Nikon D5300 w/18-55 going for $630 with free shipping, with a limit of two per shopping cart. This is sold by Amazon herself, not marketplace sellers… An annotated screenshot crop of the product page showing all these is after the jump (it is a tall picture, so it’s not on the front page to prevent taking over the whole page). NOTE: you may not see this format when you visit that page – the Amazon web servers often test different versions on different browsers, operating systems, screen sizes, and Viewports (the visible part in the actual browser window, which on a desktop may be significantly different from the screen size/resolution; that was a long way of saying, browser windows can be of many different sizes on a desktop, from full screen to tiny little boxes). To the latest eBay Deals we geaux where we find the imported / gra market new condition Nikon Coolpix P530 superzoom offered for $230 with free shipping by eBay seller “bigvalueinc” (99.3%). Please note this does not come with a Nikon USA warranty because it was imported by the seller without their “blessings”. 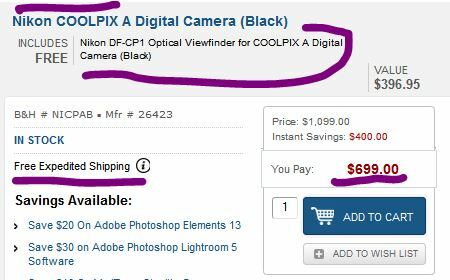 The seller offers their own one year warranty… The new condition price from authorized Nikon dealers is currently $350 (eg Amazonia)… Given the price difference, for some, this may be a reasonable risk. For others not so. We blog, you decide! UPDATE: if you prefer the comfort of a blessed-by-Nikon USA model, you can get it for $230 with free shipping, in factory refurbished condition from BuyDig’s eBay store. So you can trade-off new/imported vs refurbished/authorized. Thanks to one of our readers for the email alert! We are now starting to digest the B&H PDN Specials, starting with a nice Big Sensor Prime offer. The “Nikon A”, in new condition, is on sale for $700 and during this sale, B&H Photo will also include the Nikon DF-CP1 optical viewfinder for FREE! This is available in either black Nikon A bundle or silver Nikon A bundle. Promotion ends on 10/31/14 at 11:59pm ET. If you are looking for a double-figures superzoom that is powered by AA batteries and you are cool with manufacturer refurbished cameras, Adorama is offering the refurbished Nikon Coolpix L610 for $70 with free shipping (black or silver) and the refurbished Nikon Coolpix L620 (black) for $85 with free shipping. These are powered by two AA batteries. If you are looking to add double figures AA-powered compact-zoom cameras to your rotation, Adorama has two refurbished candidates on sale (red ink for the price): the Coolpix L610 goes for $70 with free shipping in either black L610 or silver L610. Meanwhile the black L620 goes for $85 with free shipping… Figuring out which one of the hundreds of superzooms to get? That’s should be a 40-page PDF research report! Curious about Nikon’s Android 2.x camera attempts but don’t want to pay triple figures for it? For a limited time, you can get the refurbished Nikon Coolpix S800c for $90 with free shipping and with a 90 day Nikon warranty and free returns from Google Goods.